Tulsa-based wedding planner and designer, Erica Scott with Erica Weddings, and her team of fabulous Tulsa wedding pros created one gorgeous tabletop display as seen in the latest Spring/Summer 2011 issue of Brides of Oklahoma magazine. 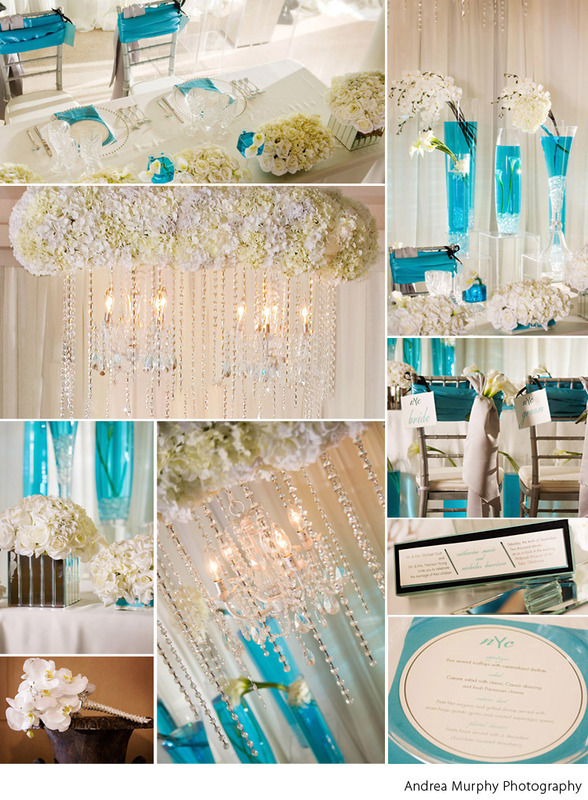 We love her clean and crisp palette of white and slate with bold pops of turquoise, accented with tons of crystal and mirrored embellishments. The tabletop floral decor was created by the team at Ceremonial Blessings and we are in love with this grand, floral chandelier dripping with crystals – so glamorous! Inspired by NYC, the centerpieces consisting of multi-level floral clusters laid on the slant surrounded by the glow of candlelight mimic the dimension of The Big Apple’s breathtaking skyline. This invitation suite is impressive housed in its own mirrored box, and we love the complementing menu card and chic bride and groom chair tags – all created by Paper Girl in Tulsa. Dress My Event provided the unique chair drapings and Empire Lighting Design added soft and elegant up-lighting. Petal Pushers in Tulsa provided this stunning bouquet of phalaenopsis orchids with handle wrapped in crystals, which completes the look for this modern-glamorous affair! Photography by Oklahoma wedding photographer, Andrea Murphy Photography and behind the scenes video provided by Oklahoma wedding videographer, Von Wedding Films.